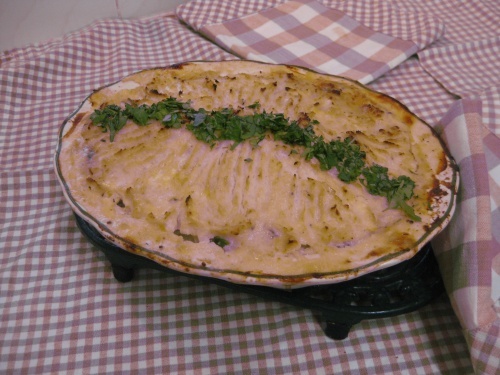 Fish pie is very popular and so is cauliflower. Here the cauliflower takes the place of potato on top. The addition of spinach not only adds to the taste but to the colour also. You will need a pie dish approximately 1 litre capacity and a food processor. Break the cauliflower in to florets and boil for 10 minutes or until quite tender. Drain well and allow to steam dry. Put in to a food processor with the crème fraiche and blitz to a puree. Add salt and pepper. Make a sauce: melt the butter, add the flour and stir over a low heat then gradually add the milk, stirring between each addition. Simmer gently for 2 minutes. Add the mustard and season to taste. Wilt the spinach in a little water, squeeze out as much water as possible then add to the sauce. Cut the fish in to large chunks and add. Put in to the pie dish, top with the cauliflower mash, sprinkle with the grated parmesan. Bake for 20 minutes. To get a crisp crust finish under a hot grill for 5 minutes. Green vegetables go well with this.